Some problems are the natural ups and downs of life, like a bad mark or a sloppy roommate. There’s a question of whether today’s young adults are somehow less equipped to cope. “Not all pressures can be removed,” says Woolf, principal of Queen’s. “There is pressure just by going to university, or doing anything in life.” When he was in university in the 1970s, he recalls, students didn’t fret so much about their marks, or employment prospects after graduation. “If we got a bad mark, it was ‘Too bad, on to the next one,’ ” Woolf says. “There’s a generation of students now—and I’m not saying it’s every student—but a tendency to want to be a winner in all that they do. They all get a trophy at field day; they all get a treat bag at the party; and then they get to university and suddenly find they’re now playing in a different league, and no longer necessarily the smartest in their class.” Woolf is quick to note that serious, long-term mental health struggles are a different matter. The ability to cope is an acquired skill, and one that takes time to learn. “I speak to parents who insist their children not take summer jobs so they can go to summer school, to get the best marks,” says Trent University psychology professor James Parker, who holds the Canada Research Chair in Emotion and Health. “I say, ‘I’m not sure that’s the best strategy.’ ” It’s often at those summer jobs that kids learn resiliency: serving coffee, waiting on tables and dealing with demanding bosses and crabby customers. Overprotective parents may think they’re helping their kids, but once these kids arrive on campus, small problems can seem overwhelming. Getting over the hurdles of life takes time for introspection, and that’s also in short supply. Students aren’t left alone with their thoughts on the bus to school or the walk across campus. They’re texting, listening to music, checking Facebook or Twitter, often all at once. There’s no time to mull over difficult, complicated emotions, and no immediate reason to do it, either. Our team serving Born for More and Origin in the UBC campus community realize with other campus ministries that the issue of mental distress and illness must be brought out from the shadows. I am pleased that Power To Change is hosting Tim Chan and Dr. Sharon Smith tonight at Wood 1 at UBC. I encourage you to go and consider the information and the insight they have. Tim will be sharing from personal experience and how his faith informed his journey through his depression. He has written about it on his blog. So you are a returning student to University and you know that you OUGHT to create some new routines for your life. Don’t let laziness keep you from putting into place some habits that will help you in the long run. And, don’t despair new habits really do take time and practice to establish; some people have suggested that it takes 42 days to put a new habit firmly into place. Routines like brushing your teeth and washing your clothes–well we hope those are in place. But if you are just showing up as a new student or you were really went on holiday even from your routines over the summer, now is the time to get some of these in place. Its unlikely that you will get them all going but here’s a few. At Origin, You Were Born for More we talk about two sets of habits or routines: Get Alone habits and Get Together habits. These habits are supportive of Jesus’ call for us to love God and to love people. Here’s a list of possible routines that would really help you during University. Nail down when you are going to do laundry. Get connected in a faith community. These groups have regular rythms of life that often contribute to a healthy life. Pay attention to your money: When do you pay the bills, check your balances, contribute to your assets and savings? Call home. Stay connected with family and friends. When do you grocery shop and where? Get into a regular Bible study group. Study breaks — walks work for me! Join a group to regularly “give back” through community service. Set up a dinner group. Set up a learning group. Set up a social group for whatever you really like to do. Join a club–Participation in the club might even pull several of these needs together for you. When do you clean the place up? Clutter distracts! You may have noticed at some of the Residences or at Irving K Barber, The UBC Chaplains are encouraging students to put routines in place this month. Many routines connect to the spiritual side of life! 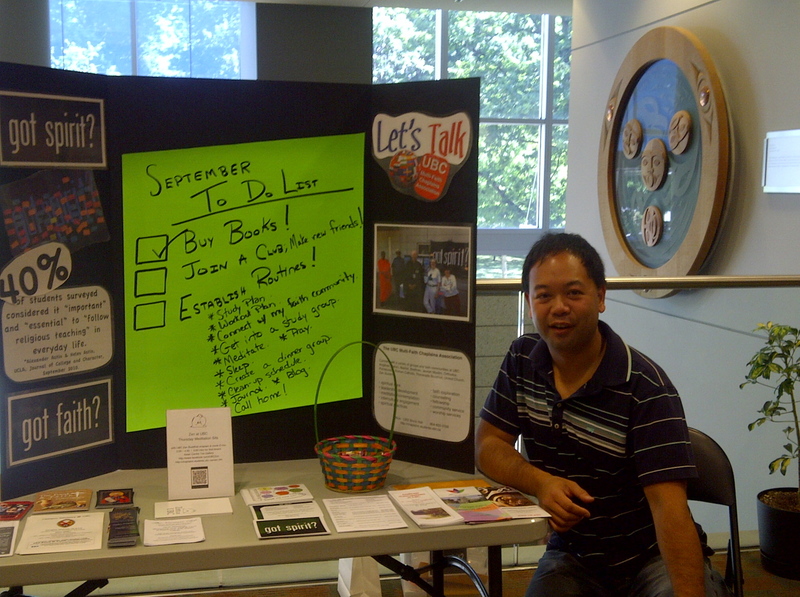 Here’s a picture of my friend Kevin, from St. Marks, connecting with students at the Irving K Barber Centre for Learning at UBC. What routines are you putting in place this month? How to talk about religion… at school. Teaching about the world religions made the news in Canada a few months ago as the Supreme Court upheld the Quebec public school system’s requirements for its students to take an ethics and world religion course. I like the concept and idea and believe that we should continue to develop a curriculum that encourages public discourse in our schools of religious ideals and ethics. The pluralistic nature of our urban communities and universities guarantees a growing need to equip students with skills for understanding another person’s worldview–even if its a religiously informed view. In recent years, the call has increased for U.S. students to study foreign languages. In an interconnected, global society, the argument goes, Americans must be able to communicate effectively with a diversity of peoples and cultures, whether for purposes of commerce, research, or national security. But given the prevalence of religion talk in today’s world, another form of fluency is increasingly needed: Civic multilingualism is the ability to converse across different religious and ethical perspectives in search of understanding, compromise, and common ground. At home and abroad, this may represent the greatest social challenge of the 21st century. To meet this challenge, public schools cannot sidestep the influence of religion in society. Nor should they cultivate a model of citizenship that avoids religion talk altogether. Public schools often see their role as promoting tolerance of diversity, and this is certainly important. But tolerance can be entirely ignorant—students don’t have to know anything about other beliefs or ways of life to tolerate them. Respect, however, requires an appreciation for why religious adherents believe or live the way they do. Students who have this understanding of their fellow citizens’ religious commitments will be better equipped to thoughtfully discuss those commitments, especially when conflicts arise in the public square. This past weekend one of my kids turned thirteen. My stressor was how to turn a UBC campus scavenger hunt into an epic event for thirteen year old boys. Turns out the weather took care of that for me. It poured! We scavenged. Along the way, my son says they ran into a skateboarder making his way across the campus with his shirt in hand. As he sailed past them he cried out, “Hey young ones, what are you doing out here?” An appropriate question. Buried within the text of David Suzuki’s 1989 publication, Inventing the Future, is an article entitled, “Prostituting Academia.” His concerns voiced 22 years ago are just as relevant today. The article raises a question for me: Are tenured professors meant to be the voice of conscience for the university? I don’t deny a role for university faculty in the application of new ideas. Our top-notch people are Canada’s eyes and ears to the world’s research, and good people will have ideas that can eventually be exploited. But the deliberate and urgent push to economic payoff distorts scholarship within the university and subverts its thrust to the will of those who have the money. Profit and destruction are the major reasons for the application of science today, while environmental and social costs are seldom seriously addressed. That’s why we need scholars who are detached from those applications. I remain a faculty member of UBC and because I care so much for the university I am compelled to speak out in criticism. Tenure confers the obligation to do so. I don’t condone but can understand why university scientists, who have been underfunded for so long, are welcoming the Faustian bargain with private industry. But I fail to comprehend why philosophers, historians and sociologists who should know better are acquiescing so easily. The headlong rush to industrialize the university signals the implicit acceptance of many assumptions that have in the past been questioned by academics themselves. For example, free enterprise, like most economic systems is based on the unquestioned necessity for steady growth–growth in GNP, consumption and consumer goods. Steady incremental growth within a given interval is called “exponential growth,” and any scientist knows that nothing in the universe grows exponentially indefinitely. Yet economists, business people and politicians assume the explosive increase in income, consumer goods and GNP (and inflation) of the past decades must be maintained to sustain our quality of life. Historians know that this growth is an aberration, a blip that must inevitably stop and reverse itself. But how can the fallacy of maintainable exponential growth be seriously challenged when the university is busy selling the myth that it can maintain such growth? Alexander W. Asten, Helen S. Asten, and Jennifer A Lindholm, UCLA, published a full report on their extensive study of the spiritual lives of university students in the book Cultivating the Spirit: How College can Enhance Students’ inner lives (2011, Josey-Bass). Among the many interesting observations drawn from their study are comments on the impact a school’s faculty has on spirituality among students. When faculty directly encourage students to explore questions of meaning and purpose, students become more likely to show positive growth in levels of Spiritual Quest, Equanimity, Ethic of Caring, and Ecumenical Worldview. Likewise, if faculty attend to students’ spiritual development by encouraging students’ expressions of spirituality, and by acting themselves as spiritual role models, students show more positive growth in the same four spiritual qualities as well as in Charitable Involvement. Although many faculty view the spiritual dimension of their lives as important, we nevertheless observe considerable reluctance within faculty on the place of spirituality in high education. For example, when asked whether “colleges should be concerned with students’ spiritual development,” only a minority of faculty (30%) agree, a response that seems inconsistent with the fact that the majority of faculty endorse undergraduate goals such as helping students develop self-understanding, moral character, and personal values. As we have already said, this apparent contradiction may well stem from the discomfort many faculty have with the term “spiritual.” One wonders if some of this discomfort would be alleviated if faculty knew how we have attempted to define and measure “spirituality” in the current study and what we have found with respect to students’ spiritual development. In other words, it would be interesting to see how many faculty would embrace the idea of assisting students in their search for meaning and purpose (spiritual quest), in attain greater equanimity, in being more caring for others (ethic of caring), in participating more actively in charitable activities, and in becoming more conversant with different religious traditions and enlarging their understanding of other countries and cultures (ecumenical worldview). As one faculty member reflected: “I’d say there’s very little opportunity (on campus) to talk specifically about spiritual matters. On the other hand, there’s lots of opportunity to talk about some of the principles that come out of that, like compassion; a willingness to help others; finding your own voice; and knowing yourself. The principles that come out of spiritual orientation can be, and in fact are, integrated into a lot of the academic life. But my impression is that talking about it directly is discouraged.” Cultivating the Spirit, p. 150-151. As I reflect on my own university experience the faculty that made the most impact in my life shared not often but sometimes their spiritual perspectives and musings as it related to what we were studying. I remember both negative and positive responses in myself and my classmates. But there’s the thing — I remember. Of all the many classes forgotten, these are what I remember. As I think about the students and faculty at UBC I hope the value of engaging the spiritual conversation in the context of the classroom will be raised — for there much memory and influence for good can be gained.